In the past sixteen years more than 90 Westerners have been kidnapped in the Sahara. I do not want to add to that number. Since 2003, 95 Westerners have been kidnapped in 28 kidnapping incidents across North Africa (see map) and most of these kidnappings have been in the Sahel area. 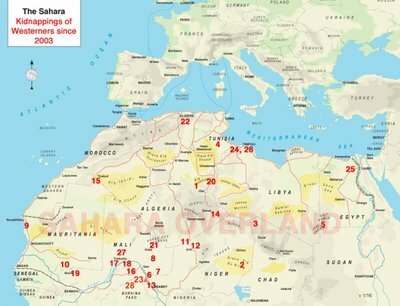 Sahara-Overland has a detailed page if you are interested, but the outcomes are as follows: 49 hostages have been ransomed. 18 were freed in army raids while four have died in failed raids. Two have been released voluntarily by their captors; six have been executed by them and four have died in captivity, usually due to health issues. 12 are still held by their kidnappers. The other sort-of-good news is that most hostages are being held for ransom and that the kidnappers are becoming excellent at keeping their hostages alive. To the point where a Frenchwoman with cancer received her medication even though she was held captive in the middle of the Sahara. Danes are not targeted either. This is because the kidnappers are well aware that individual governments, in particular, the German, Austrian, French, Swiss, Spanish and Italian governments, are willing to pay ransoms. Kidnappers, therefore, target nationals from these countries. The governments of cause deny paying any ransoms. Instead, the payments are handled by ‘third parties’. Ransom payments then appear as “development assistance” in the national budgets. The “bad news” here is that no Danes have been kidnapped in the Sahara prior to my trip and I have not been able to figure out how Danes have been released elsewhere in the World. So I do not know how the Danish government would position itself in the hypothetical case that I would need a ransom. Though I do fear, they are on board with the American and British ditto, who do not pay ransom. This, put bluntly, means that I have less of a risk of being kidnapped, but a higher risk getting executed should it actually happen. So that should probably be the first lesson: Know who is the target group, and the do not be part of it. The second lesson would be to realise that the kidnappings are rarely spontaneous. By now they are most often planned, and well planned too. The perpetrators need a getaway route, a car and a hiding-place for the first few days. In most cases kidnappings last months, requiring, even more, preperation. The groups in the Sahara are indeed getting more professional, but even they need a few days to figure out your nationality. That means it is possible to take a few precautions. Not staying in the same hotel for more than a couple of nights goes a long way. So does mixing up your daily routines; taking different routes from, say, your hotel to the market; eating at a new place for every meal; avoiding empty streets, and not going out at night. These precautions should be taking when travelling in areas where kidnapping risks are high. Lastly, avoiding public transportation might be a good idea for certain trips. The alternative here is to get your hotel or local authorities to recommend you a reliable driver who can ferry you safely across rural areas where the government have less control. Finally, anyone contemplating going to an area where there is a risk of kidnapping need to understand the mental dilemma this brings. I would not travel here if I were not ready to face the risk – nor should anybody else. However, this is a very selfish position to take. Just like suicide is a selfish act. My death or kidnapping will affect my friends and family far greater than it would affect me, and they had no chance to influence my decision about going here. Death is certain for all of us and once we are dead – like before we were born – we will not be around to worry about the fact that we are not alive. All the pain and suffering are left for those we leave behind. But how great is the danger really? In 2012 10.000 people visited Mali (down from 200.000 in 2011). Out or those 210.000 visitors seven got kidnapped. So the risk is limited. Of the 10.000 people visiting Mali in 2012, just one got kidnapped. 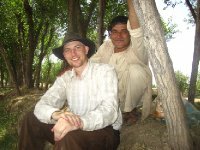 The other Mali-kidnapping in 2012 was a missionary living permanently in the country. And all eight people kidnapped got kidnapped in parts of Mali I do not plan to visit. In other words: I am still far more likely to lose my lift to the crazy traffic down here than to any terrorist attack or kidnapping. Not that I plan to get killed in any specific way down here – but if I go, I would rather do it while doing travelling – something that I love – than in a traffic accident back home in Copenhagen. If you’ve liked what you’ve read, why not give an actual like to this blog on Facebook? Travelling is an opportune possibility to get behind all those gloomy news reports of wars, terror and catastrophes. For that to happen it is necessary not to judge a country or the safety of travelling there on the news. Safety is always an issue! 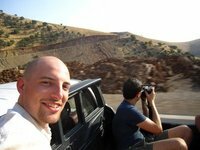 The itch for exploration is not the only thing that draws me to weird destinations, political instability, armed conflicts or outright war have always interested me in a professional way and much of my studies have evolved around these topics. Travelling gives me a chance to see and experience what I read about. Afghanistan and Iraq have been the most prominent examples, but places like Iran, Sudan, Palestine, and some parts of Guatemala have also landed me some raised eyebrows and harsh comments from friends and family. So will places like Mali, Burkina Faso or maybe just the entire region West Africa. With all the stories on the news featuring these areas, it is hardly surprising. Who in their right mind would go to Iran, a rogue state persuading nuclear weapons, or Sudan, a country most famous for genocide and civil war? Let alone quagmires such as Afghanistan or Iraq. However, I try not to pay too much attention to ‘the News’ – their innate nature is to be sensational, to blow the slightest incidents out of proportion and to fixate out minds with circles of vicious news that can both horrify us and keep us glued to the screen. At least, the terrible events regularly featured on the news would not put me off from contemplating a visit to a particular country. Instead travelling these places gives me the opportunity to see beyond the news reports. I mean, imagine what we would think about Americans if we only took our impressions from the news. Gun-loving, religious fanatics, who want Donald Trump to rule the world. Luckily, most of us have fortunately met Americans in person, who have counter-acted that stereotype by been friendly, bright, sophisticated and just kind people. This helps us to get the better picture of the country’s population. How many have ever met someone from Iran or Sudan? Someone clever once said that the news is full of death and destruction exactly because that is news. That is, for most people, most of their lives are quite, relatively peaceful and mostly concerned with making ends meet. This is probably true for both the London lawyer and the Malian camel herder. 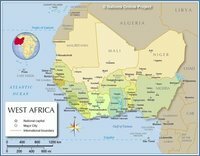 Going to West Africa will be an insight into a continent that only features in the News for two reasons. 1) War, hunger and general human misery and (2) those almost racists National Geographic documentaries depicting Africans as backwards tribes living without modern utilities in small huts. All this does not mean that I wander headless into harms way. Travellers, including myself, spend a lot of time worrying about our safety before and when we head into places like Mali and Afghanistan – why would we not be the ones most worried about our safety in these locations? I usually spend a lot of time, reading up on local news, other travellers’ reports, requiring information about the particular situation on the ground, ask into unsafe areas at embassies and try to outline what the risks would be and where they are actually a concern. I pay less attention to the governmental travel advice, which is always very, very conservative and designed not so much to keep you out of harms way, but rather to limit the government’s hassle of getting one of their citizens out of trouble. That might sound like a conspiracy theory (and I will be happy to fold myself a tin-hat if you can prove me wrong). But Western Governments newer warn about terror risks in other Western countries – and let's face it, there is a danger of getting blown up if you run a marathon in the States, take the subway in Brussels or attend a concert in Paris. But no travel warnings are given. Instead, plenty of warnings are given about countries like Mauritania and Burkina Faso. The former have had zero terror attacks within the last fifteen years; the latter has had one. Interestingly enough, the biggest risk I am running in West Africa is kidnappings. More than 90 Westerners have been kidnapped in the Sahel region since 2003. Granted there has actually only been 28 kidnappings, but a few of them have included large groups of westerners, either tourists or professionals working abroad. How exactly I plan not to be one of those people will be part of the fourth and last ‘Stupid, but Lucky’ blog entry. However, most locals rather want to help you than hurt you – and travelling you rely ultimately on the hospitality and friendliness of the local population. That is why I only bring one weapon with me on my travels – my smile. With no more undiscovered ‘blank spots’ on the map, exploration and discovery is now an individual adventure of experiencing how others live. But that does not prevent me from dreaming myself back to the deck of James Cook’s the Endeavour. I have to admit that I am very much a romantic when it comes to travel. Romanticism is often defined as an emotional glorification of the past. It is thus, by definition, anti-rational and anti-enlightened. 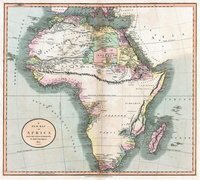 If I could, I would have joined the early European explorers, the ones who expanded our conception of the world, our knowledge of it and eradicated blank spots on the map. Given the chance, I would happily have joined James Cook’s expeditions of the Pacific; Magellan, who’s ships first circumnavigated the Earth; or joined Livingstone’s trek across Africa. This despite the dangers that would follow by setting out on such expeditions: Both Livingstone and his wife, along multiple travel companions, died on his expeditions; Cook lost more than a third of his crew, and only 18 of Magellan’s 270 men crew survived that first circumnavigation – Magellan himself died in the Philippines, only halfway through the voyage. The fact that everybody is heading for Southeast Asia, Australia and India (and to a lesser degree Central and South America) means that there are plenty of travel stories informing us about those places. So, what is then left to discover and explore? Further, the share amount of travellers and tourists traversing those areas mean that the local communities have adopted. Tourist infrastructure has made everything relatively easy and the adventure of travelling is dimmed as a result. Most visitors are staying in hostels and hotels with other travellers. There are minibus services, catering explicitly to visitors so they do not have to struggle with local transportation. And Western culture, although with a local twist, is made readily available through full moon parties, beach bars and international fast food chains. While there certainly is exploration left to be done in the less touristic areas of these places, it is impossible to avoid the crowds. Honestly, there is not much Dr Livingstone’s Adventures about being run over by a tourist bus in front of Angkor Wat or the Taj Mahal. In short, the popular destinations are very far from the hardship, difficulties and discoveries I want – and think - my travels should be full of. Travelling for months is not a vacation. It should not be treated as an extended weekend of fun, in a place that is a bit sunnier than home. Exploring the unknown. Being far from friends and family. Struggling through terrible bus-rides, food poisoning or corrupt officials. The feeling of being lost, weakened or threatened (the last is rare). These are all valuable parts of a romantic’s adventurous explorations. Part of my travelling. As much as enjoying a beer on the beach at sunset is it. Actually, that beer tastes a lot better after a 36-hour bush-taxi ride, where you had to share your seat with a goat, than after 8 hours in an air-conditioned minibus shared with just four other backpackers. Travel is exploration and exploration is suppose to be tough. The hardship only makes the experiences of discovering new places feel that more real – and as a result that more enjoyable. “Why would I ever go to West Africa?” is a question that will take some length to answer. To spare you that very long blog entry, I have instead written a number of entries that each can be read separately. People often react with disbelief when I tell them where I am planning to go or where I have travelled in the past1. Through the years, these comments have questioned my sanity, intelligence or both – and sometimes deservingly so. But most times, it is simply a matter of armchair experts who's advice and opinions rely primarily on whatever they saw on the news three years ago. Often combined with an impressive lack of knowledge about local geography or the current situation on the ground. Throw in a few negative presumptions about the given places and that is usually not a wrong description of what some people think about some of my favourite travel destinations. If I do have the time, and I am allowed, I can talk at length about how and why countries that frequent the news for all the wrong reasons can be great travel destinations. Then I am happy to correct the armchair experts. This is also why I am writing this particular piece of the blog right now. However, it is not everybody who are willing to listen and when my listeners become too dismissive, I sometimes loose interest in explaining just why “dangerous” place are fantastic to travel in. Then I usually go to my favourite short answer: “I’m somewhat stupid about choosing my destinations and have just been lucky not to get killed or kidnapped on my previous trips.” In other words: I am stupid, but lucky. Though most of my friends have accepted that I visit weird places with a somewhat head-shaking attitude, this trip to West Africa has not been spared the usual comments. The curious questions about why, of all places, I want to go to a part of the world where extreme poverty and diseases are making life miserable for most people living there, are still frequently asked. If I am in an expressly sarcastic mood, I happily extend the list of ills before answering their questions. I mean, they should not forget that West Africa is also home to Islamists kidnapping Westerners for ransom; civil wars in Mali and Niger; Boku Haram in Nigeria; bombings in Burkina Faso; general instability across Côte d’Ivoire; and an Ebola endemic, which have just reemerged in Guinea. This is all very terrible for the local populations. It is, however, not something that would ever deter me from travelling here. Since I am still in Morocco, which is more a part of North Africa, rather than the west, I figured that I would spend the next few blog entries explaining exactly why I am going to West Africa, why I travel to all those weird places, why the list above is not what worries me about my travels, and how – in general – I plan to survive all of this. 1) Should anyone be unfamiliar with my earlier trips do they include, amongst others, the Middle East, six months after Danish embassies were burned due to the Mohammad cartoons; Central Asia, including northern Afghanistan; Northern Iraq and all of Iran; Central America’s drug circumnavigationsmuggling trail; and now I am in West Africa – the allegedly the toughest region to travel on this planet. How much did I actually have to prepare for leaving my life for a year to go travel? You simply need a god hat! I like to tell myself that I did not need to prepare anything before heading to West Africa for a year. That is, of course, a lie. However, besides spending two years saving approximately 12,000 Euros while finishing my education, I probably prepared less than many thinks – and less than many others would have done. The truth is that it actually does not require a lot to go travel, not even for extended periods of time. A passport, a sense of adventure and enough money for the duration of you trip… and preferably a good hat! Specialised gear (including camping gear) can be rented in most capitals, so all you need are some good shoes and a decent backpack. The amount of money clearly depends on your level of comfort and travelling style. The hat is a personal preference, but this is honestly all you need. You have clothes in your closet, and the sense of adventure will take care of everything else – just keep telling yourself that. This is the bare minimum and for comfortable travel, you need a bit more. I have been blessed by past trips. 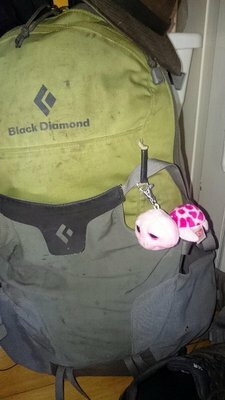 That is, I already had a good backpack, a travel towel, lightweight and fast-drying clothes and an idea about just how little ‘stuff’ I need in order to travel. Most people bring way, way too much stuff with them. Hence, the cliché travel advises: “Spread everything you want to bring with you out on the floor in front of you. Then leave half of it behind.”. 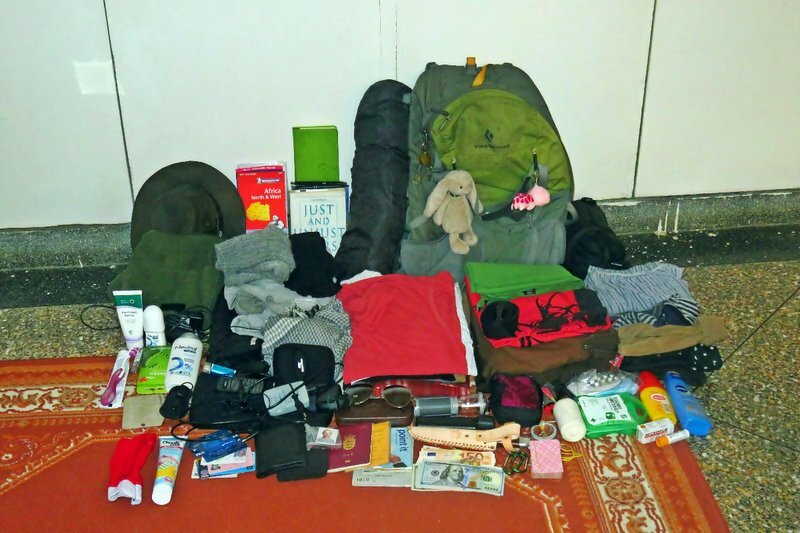 Just to give you an idea of how little I am bringing with me have I added the complete list at the bottom of this post. It might seem like a lot in list-form, but those 12 kgs it combines is not a lot for a whole year. Other than what I already had, there were a few things I needed to check off before I left. I was running out of blank paged in my passport, so I had to get a new empty and boring one. I had to order another credit card from my bank, so I would have a backup in case I lost my current card. I had to get two expired travel vaccinations refreshed. I also bought a guidebook, stash up on Euros and Dollars and got some new travel shoes. Lastly, I stacked up on medical supplies. I am going to be far from Western hospitals and a basic first-aid kit, and some antibiotics and penicillin are handy to have at hand – though I have never had any use for it myself. Instead, I have been able to help out fellow travellers in need and once acted as a doctor in a Madagascan village I passed through. Once you got everything and if you are leaving for a long trip, like I am, you probably need to get rid of your apartment, find a place for your stuff, unsubscribe newspapers, newsletters, insurances and other things you do not want to pay for at home, while you are not there. Then again, most of this can be done once you are already on the road. Realising that you are still paying for that expensive data package for the phone you are not using usually helps such things along. Then there is the mental preparation. Leaving the safety and comfort of your home. Leaving friends and family behind. That is often the hardest part of any trip. I have found from past experiences that the less mental preparation I do, the more enjoyable will my trip begin. You really cannot prepare yourself for the travel experience. It is better just to roll with the punches. If it gets too much, you can always take a break from everything by checking in at a five-star hotel and spend a couple of days in luxury. Spending too much time saying farewell is not advisable either. It will only make me sad that I am leaving. It is far better to treat the farewells like a bandage. Rip if off quickly. Only do the essential farewells in person. Maybe, have one big party where your guests do not realise that this will be the last time they see you for a long, long time. In that way, there will be fewer tears to shed. Sure, people will miss you, but long farewells will only add to that. By not saying goodbye you should buy everybody a month or so before people actually realise that they miss you. Alternatively, if you do not have any friends, consider that as one less thing to worry about. In addition to that have I bought a washcloth while down here and a fellow traveller left me some clothes soap as she was flying home.